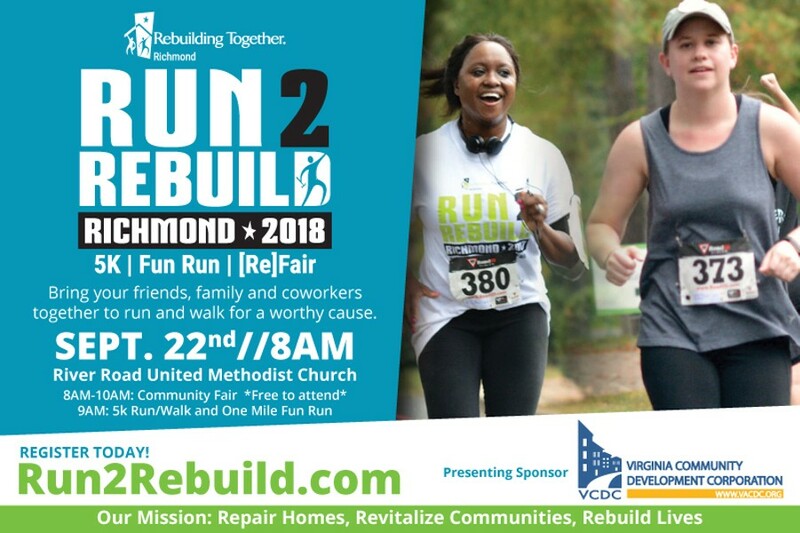 Run2Rebuild Richmond 5K and ReFair | River Road United Methodist Church | Happenings | Style Weekly - Richmond, VA local news, arts, and events. In partnership with River Road United Methodist Church, Rebuilding Together Richmond will hold its seventh Run2Rebuild Richmond 5-K and ReFair. The event will be accompanied by a run and walk, a 1-mile fun run and ReFair, a community fair that focuses on health, wellness, human services, community engagement and education. The race will occur throughout the Sleepy Hollow neighborhood surrounding the church. Proceeds from the race will support Rebuilding Together Richmond, a nonprofit organization that brings volunteers together to improve community spaces and repair the homes of low-income families in need. Sign up today to participate.